An example of using the COSMIC functional size estimation method for calculating the size of the Unified State Information and Telecommunication System “Electronic Register of Apostilles” at COSMIC functional points is considered. The approaches to estimating the complexity and cost of creating this system based on its functional size are discussed. Translated from Kibernetika i Sistemnyi Analiz, No. 2, March–April, 2019, pp. 145–154. ISO/IEC 19761:2011 “Software engineering — COSMIC: a functional size measurement method,” URL: https://www.iso.org/standard/54849.html. 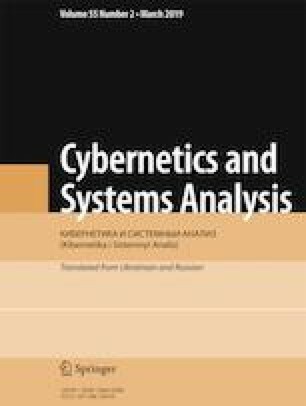 ISO/IEC/IEEE 15288:2015 “Systems and software engineering — System life cycle processes,” URL: https://www.iso.org/standard/63711.html. ISO/IEC TS 24748-1:2018 “Systems and software engineering — Life cycle management— Part 1: Guidelines for life cycle management,” URL: https://www.iso.org/standard/72896.html. ISO/IEC 14143-1:2007 “Information technology — Software measurement — Functional size measurement— Part 1: Definition of concepts,” URL: https://www.iso.org/standard/38931.html. “COSMIC Methodology of Measurement of Functional Size. Version 3.0. General Definitions,” URL:https://cosmic-sizing.org/. DP National Intelligence Systems (NAIS). URL: https://nais.gov.ua. F. Vogelezang, “Using COSMIC-FFP for sizing, estimating and planning in an ERP environment,” in: Software Measurement Conference, IWSM/Metrikon (2006), pp. 327–342, URL: http://peerevaluation.org/data/ef50c335cca9f340bde656363ebd02fd/2006_IWSM_-_Using_COSMIC-FFP_for_sizing,_estimating_and_planning_in_an_ERP_environment.pdf. “The international database of control parameters of ISBSG group,” URL: www.isbsg.org. IT Ukraine, “IT services and software R&D in Europe’s rising tech nation” (2016). URL: http://uadn.net/files/ua_hightech.pdf.